A visible presence in the Catholic schools, Bishop Cunningham enjoys interacting with the students, including those at St. Rose of Lima School in No. Syracuse. I salute all involved in the education of our young — parents, teachers, principals and school staffs. They truly touch the future as they educate our children and young people. We owe them a debt of enormous gratitude! 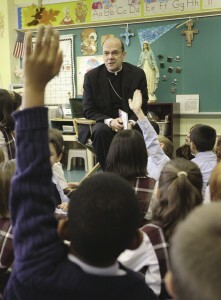 Catholic schools, I believe, remain the most effective vehicle for passing on our Catholic faith to our young people. And our teachers, religious and lay, deserve our admiration and respect. Their commitment to our Catholic schools should be noted and gratefully acknowledged. Last year when Pope Benedict XVI visited our country and met with Catholic educators, he called them “bearers of wisdom.” The word wisdom comes from the Latin word “sapientia” and means “tasting knowledge” — the knowledge that is delightful and not merely abstract. Wisdom is like the experience of tasting a good dessert, a very different experience from reading the recipe for the dessert! As a gift of the Holy Spirit, wisdom enables us to delight in the love God has revealed to us in His Son, the Word made flesh. As “bearers of wisdom” our Catholic school administrators and teachers are called to instill in their students a taste for knowledge not only about math and science, social studies and literature, but most importantly, a taste for knowledge about God and His plan of salvation for all His people. This knowledge is not abstract information about God, but rather a “knowing” Him that is more fittingly called love. I am grateful to the 530 lay teachers, clergy and religious, and the 285 non-teaching personnel who staff our schools. All of them are called to witness to the Gospel in our 26 schools that educate approximately 7,750 students from Pre-K through 12th grade. I thank parents for entrusting their children into our care. I am grateful also to our pastors and parishioners who continue to support Catholic school education. 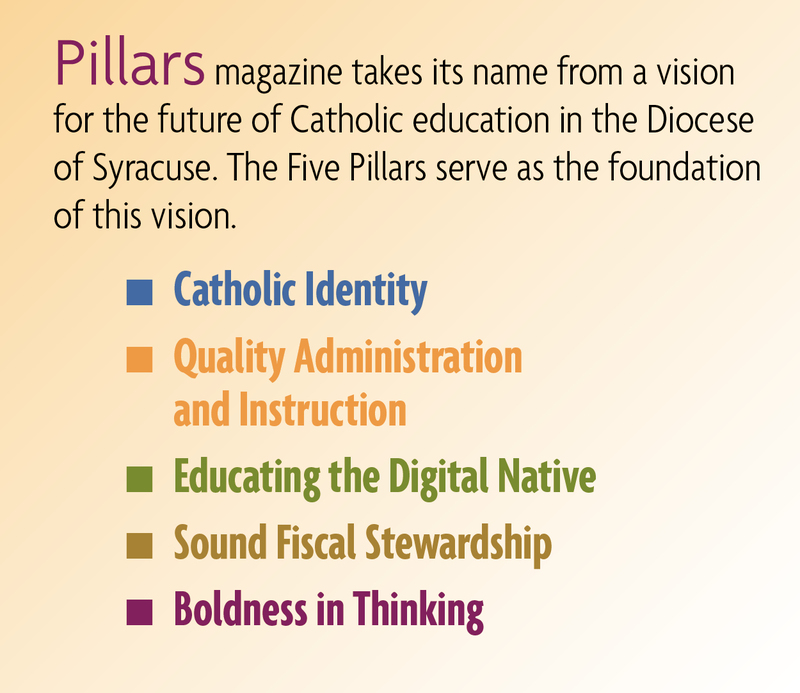 The national theme for our Catholic schools this year is: Catholic Schools: Dividends for Life. In these difficult economic times, I am confident that our Catholic schools will produce long-lasting dividends. A Catholic school education is a priceless investment in a child’s future. A visit to any one of our schools will show dedicated faculty and staff, and students eager to learn. A visit would enable you to experience a future that is bright with hope.